The Ancient Ozarks Natural History Museum is one of the most interesting attractions in Branson that will take you back in time as it features many fascinating places showcasing how the Ozarks begun. The museum was created to showcase the history of the Ozarks including its stunning natural beauty. These attractions in Branson have great features of artifacts, images and interactive exhibits that are chronologically displayed as you walk through the museum. If you visit the Ancient Ozarks Natural History Museum you can have the opportunity to explore the rich past of the Ozarks. 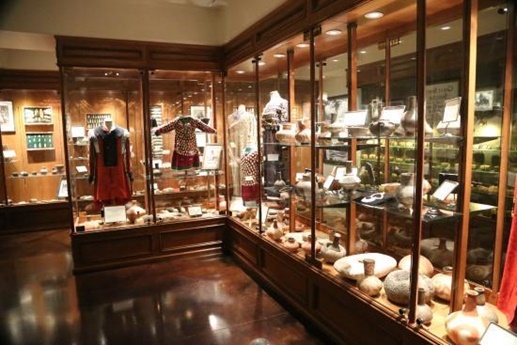 As you explore this wonderful museum in Branson, you will learn about the people and the different kinds of animals that have inhabited the region for over 12,000 years. Johnny Morris, founder of Bass Pro Shops and Top of the Rock was so amazed by the exhibits displayed at the Chicago Field Museum that he assigned the same design team to create the same style of exhibits that you’ll find in this museum. This ancient museum also features attractions that include carbon-dated skeletal remains of a woolly mammoth, a giant ground sloth, a saber tooth cat, and prehistoric cave bears. The rich ancient history of the Ozarks featured in the museum contains remains of ancient-Missouri creatures, true-to-life dioramas of animals that once roamed the Ozarks and many rooms that house Native American and Osage Indian artifacts and artwork, Civil War historical items, and many other interactive exhibits. Located at Top of the Rock, the museum offers on-site dining at Arnie’s Barn and Osage Restaurant, golf at the Top of the Rock Golf Course, and riding tours at the Lost Canyon Cave and Nature Trail. Other activities that you can enjoy within 10 miles include fishing, boating, biking, walking, and camping. The museum offers every guest a first-class experience seeing dioramas of prehistoric animals such as The Hell Pig, The Bear Dog, and the Terror Bird. You will also find gallery upon gallery of Native American artifacts that include arrowheads, clothing, tools, pottery, and beautiful paintings and sculptures of the native American life. Then there is the Civil War exhibit that will definitely impress the Civil War aficionado when they see war memorabilia such as guns, swords, artillery, uniforms and more. Everything in the museum is beautifully displayed with labels next to the pieces in the collection. This fantastic museum features a truly superb collection of artifacts that took many years to collect. Finding a Smithsonian like quality museum in the Ozark hills is a delightful surprise for everyone. All in all, every guest is sure to appreciate an extensive and impressive collection that is beautifully housed and displayed in the museum. The exhibits are dedicated to the Ozark region and Native Americans who lived through the Civil War. If you want to find out the rich history of the Ozarks, visit the Ancient Ozarks Natural History Museum in Branson that will take you back in time as you see artifacts and Civil War historical items.